Community Watts Rising Collective Awarded $35 Million Grant; The grant will help fund development and infrastructure projects that achieve major environmental, health, and economic benefits to the Watts community. More than two decades ago his father embarked upon a leading legacy as a pubic servant and more than two years ago his mother retired as one of the city of Los Angeles’ more trusted and respected employees. But, on Tuesday 26-year old Sebastian Ridley stepped out of those lofty shadows and into his own, becoming assemblyman of the 54th District. 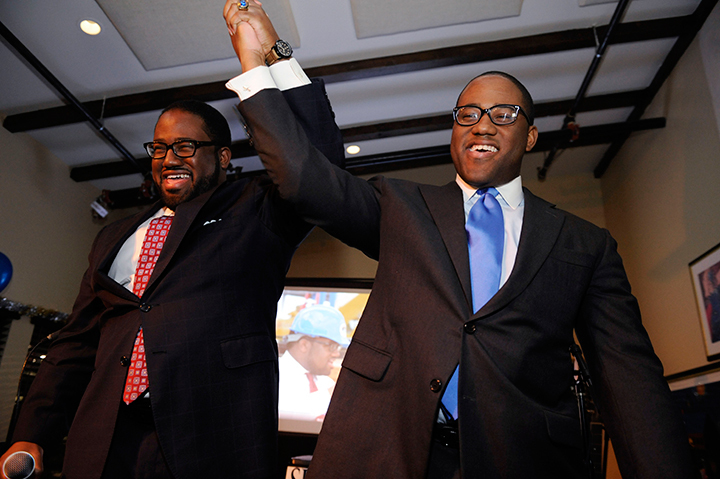 From South Los Angeles to Morehouse in Atlanta, Georgia and now on to the State Capitol in California, the overwhelming favorite to win his first election for public office, voters of the 54th stamped his candidacy with rousing approval this week. It is a journey that did not begin with his mother’s or father’s aspirations, but by his steadfastness to lead, to inspire hope and to make the region in which he resides a better place for those less fortunate. 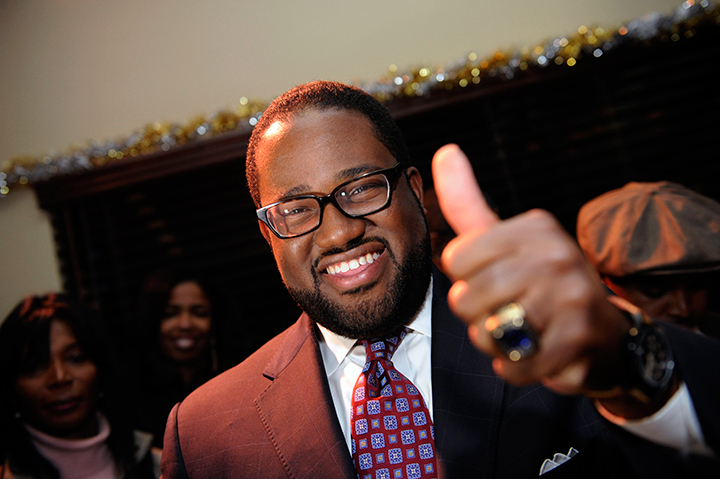 Thus, the young twin son of retired expert of conflict resolution Avis and Los Angels County Board of Supervisors Board Chair Mark Ridley-Thomas defeated Culver City Mayor Christopher R. Armenta and real estate broker John Jake by securing 60 percent of the vote (with 11,182 votes to Armenta’s 6,704 and Jake’s 744) and winning the seat vacated by Holly Robinson Mitchell who won a State Senate seat. 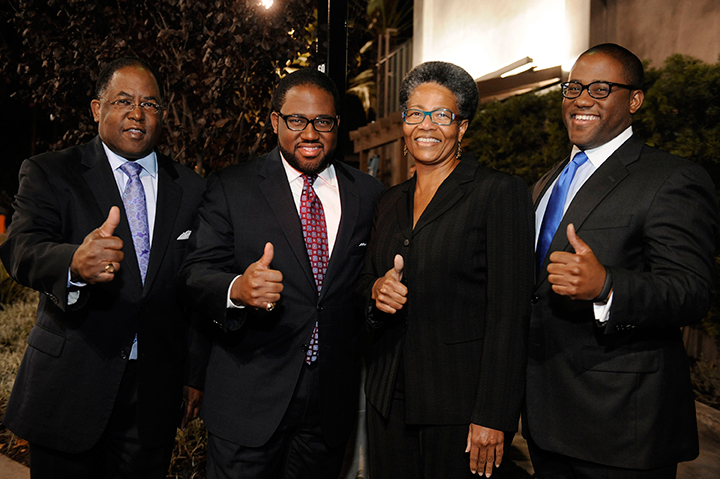 An upbeat and enthusiastic crowd of supporters that included his father, his former senator boss, 9th District Los Angeles City Councilman Curren Price, Council President Herb Wesson, Laphonza Butler (President, California SEIU State Council), former Congresswoman Diane E. Watson, newly elected Hawthorne mayor Chris Brown, former City Controller Wendy Greuel, Assembly member Steve Bradford and scores of others who joined him for his campaign celebration at the Post & Beam. The father reflected on the new assemblymember’s childhood when he was nine years old running for offices in elementary school and suggesting to him what he should say on the campaign trail. The Supervisor remembered his first election, one that he lost. “I Lost! 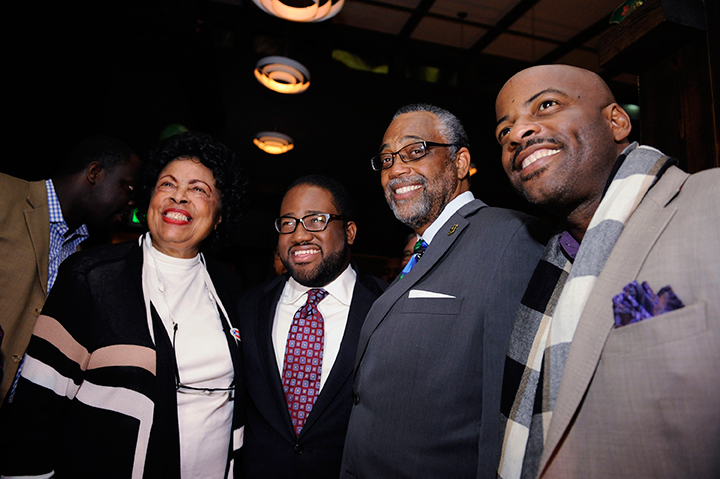 My first election in 1987, I ran for school board and I vowed that I would work as hard as I could and I have won every race since then,” Supervisor Ridley-Thomas told the Sentinel. “This is his day! It’s Sebastain’s Day! It’s his constituents Day,” he added. Reflecting on the significance of the moment of generation next grabbing the political mantel and running with it, Butler compared it to the presidential election of 2008 when American voted in its first Black President. “I think that Sebastian represents the future of Los Angeles and the future of California and he represents a lot of people’s hopes and dreams,” said Butler. The historical implications were not lost on Assembly member Bradford. Councilman Price whose supervision Sebastain has been under for the past four and a half years also had loads of praise for the new legislator. “I think that he has the kind of background training and experience that enables him to be the kind of leader that our community needs,” Price said. Council President Wesson explained the totality of the moment. “I think he’s a natural. I do believe that there’re people in this business who are naturals and I believe that he’s one. He’s an unbelievably bright, energetic young man who’s been training for this moment since he was in his teens. I think that he’s ready and we get an extra dose of energy from him. Veteran retired Congresswoman Watson said that it’s important that the baton is passed on. Endorsed by the highest-ranking elected officials in the Democratic party including Gov. Jerry Brown and Lt. Gov. Gavin Newsom, Attorney General Kamala Harris, the California Legislative Black Caucus and other legislators, U.S. Sens. Barbara Boxer and Dianne Feinstein to name a few, powerful religious leaders, The Sentinel and others, his victory was a mere formality. 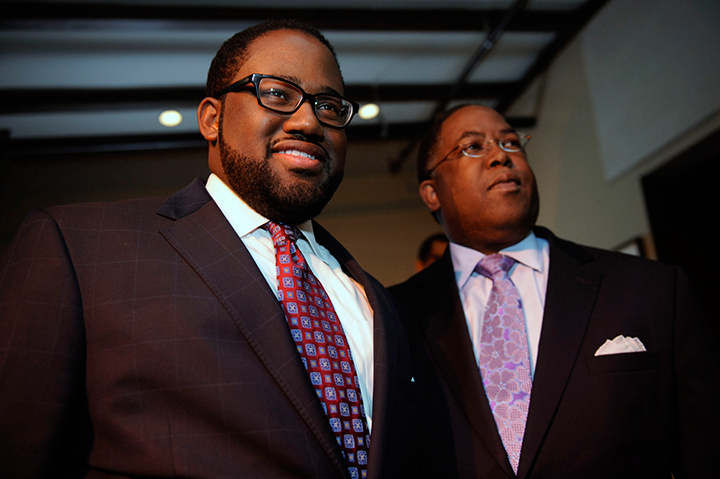 “My experiences have prepared me for the policy responsibilities and the commitment needed to represent the people of the 54th Assembly District,” said Sebastian Ridley Thomas. Los Angeles, Century City, Crenshaw, Leimert Park Mar Vista, Mid-City, UCLA, West Los Angeles, Westwood, Inglewood, Ladera Heights and View Park-Windsor Hills. His transformation started when he was a student of participatory politics and civic engagement with a penchant for public policy, community organizing, and consumer, children and small business advocacy. After cutting his teeth in the Legislative Black Caucus his policy acumen came in high demand by legislators on the state capitol. Sebastian has advised Councilmember Price for four and a half years, including his days in the senate on economic development, transportation, housing, public safety and local government. The transition for him to continue working in that capacity should be seamless. 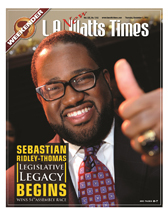 The late iconic Congressman Augustus Hawkins was too young when he was elected to the Assembly at 27, so at 26 Sebastian Ridley-Thomas isn’t too young now. His father agreed that Dec. 3 would be a day that is reflected upon some 25-30 years from now. “I have no doubt about that. 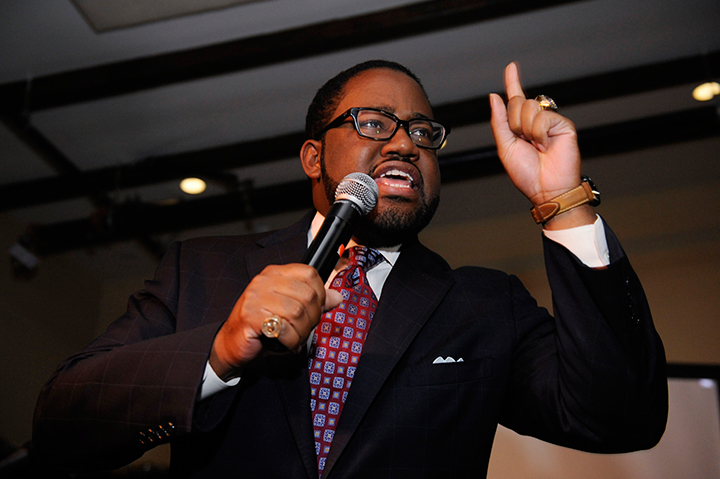 This is the beginning of the next stage of leadership, the next generation of leadership for African Americans and beyond and I am completely committed to supporting the up and coming talented leaders, and there are more coming and they want to do this,” concluded Supervisor Ridley-Thomas.